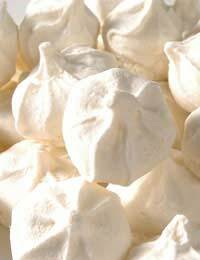 Both light and tasty, sugar free meringues are a great way to finish up a meal. At a dinner party, they look simply sumptuous in the middle of the table. You will have to use artificial granulated sweetener as your sugar substitute, however, when making sugar free meringues. Remember to read the label carefully to make sure it is suitable for baking and to follow the manufacturers’ instructions at all stages. This is a rich dessert. Seek out a bar of good quality, high cocoa content chocolate or a bar of dark diabetic chocolate. First preheat your oven to 140 deg C/275 deg F/gas mark one. Then grate your dark chocolate. Take a large bowl (metal if you have one) and whisk your eggs until they stand up in peaks. Very slowly add your granulated artificial sweetener. Keep whisking until the egg whites become even firmer still. Continue to mix still and slowly add in your grated dark chocolate. Grease and line two round sponge tins. Split the mixture between the two and bake in the oven for about half an hour. The meringues should be crispy to the touch but cooked throughout. Remove from the oven and allow to cool. Then remove from the tins. Then whip your cream until it is firm. Stir in your cocoa powder and your sugar free apricot jam. Spread on to one of the pieces of meringue. Then sandwich the two together. Bring the meringue on to the table as a whole and then slice in front of your guests. Serve with additional fresh cream if required. This is a fruity dessert that banana lovers will enjoy. Remember to choose nice soft bananas that are ripe or even slightly over-ripe. Once again, start by preheating your oven to 140 deg C/275 deg F/gas mark one. Then take a large bowl (metal if you have one) and whisk your eggs until they stand up in peaks. Very slowly add your granulated artificial sweetener. Keep whisking until the egg whites become even firmer still. Again, grease and line two round sponge tins. Split the mixture between the two and bake in the oven for about half an hour. The meringues should be crispy to the touch but cooked throughout. Remove and allow to cool. Remove from the tins. Take a hand blender and whiz your ripe bananas up with the squeeze of lemon juice until completely firm. In a second bowl, whip your cream until it stands up in peaks. Slowly spoon the banana mixture into the cream and stir in. Take one piece of meringue and spoon half of the creamy banana on to it. Sandwich it with the other piece of meringue. Then spread the remaining banana cream on top and sprinkle with chopped nuts. Chill and serve.